Plumbed Down: Mr. Gorbachev, Tear Down Joe Paterno's Statue! Mr. Gorbachev, Tear Down Joe Paterno's Statue! So they tore it down. Penn State; known mostly for their boringly white football jerseys, and the squeaky clean image of Mr. Joe Paterno, were both apparently operating in the moral grey area of mafia wives. 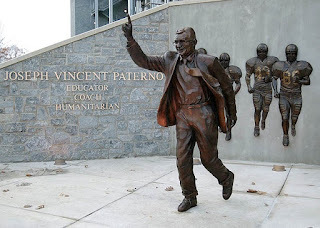 But unlike John Gotti, whose family was forgiven enough to make a reality television show, this crime was so unforgivable, that the school has to distance itself from his legacy by eliminating all things Paterno-ish, starting with his statue. I think the moral lesson learned is: Power corrupts. If that power or that corruption lasts long enough, they will tear your statues down. Josef Stalin, Vladimir Lenin, Saddam Hussein, and the Berlin Wall (okay, not a person…but) among others are now laying broken in museums or souvenir pieces are spit on at home by their victims. In ancient Rome they would vindictively chisel names out of monument existence along with destroying any corresponding statues. 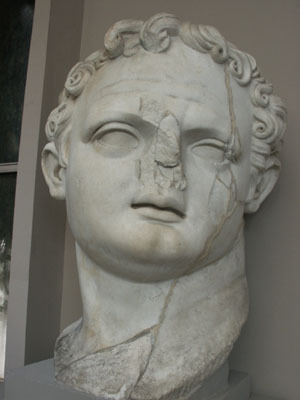 Emperor Domitian (Caesar 81-96 A.D.) had a damnatio memoriae passed by the Senate after he was assassinated by being stabbed in the groin. His coins were melted, his images broke, His arches destroyed, his name erased from public record. Talk about a bad couple of weeks. Hell hath no fury like a Roman scorned. But it seems silly today, to build statues, knowing how quickly we will judge those people by tomorrow’s standards. I’m 32, and in my lifetime I’ve watched as new evidence has turned on former heroes like Christopher Columbus, Thomas Jefferson, Colon Powell, Mark McGwire, Barry Bonds, Lance Armstrong, Mel Gibson, and a plethora of other people who made some mistakes that regulated them into the trash bin of tabloid news. I guess this means no "Braveheart 2: No Guts no Glory"? Obviously, what Joe Paterno’s friend, assistant coach Jerry Sandusky, did was abhorrent. Protecting children from any kind of abuse is probably the one law, rule, statute, morality issue we as humans can all agree is one of the highest priorities of any society. IF, and that’s a big IF, Joe Paterno knew the extent of how far into sickness that Jerry was traversing, and still did the little he did do, then fine. Tear down his graven images. Burn the memories. Destroy the film of his ’82 and ’86 National Championships. Expunge the records of his victories (which would eliminate the loss of the 1995 Rose Bowl by my Oregon Ducks). And chisel his name out of coaching lore. But it seems silly. It still happened. Like people who say today, “America should never have dropped the atomic bombs on Japan in 1945.” Yeah, we know it looks bad by today’s standards. But it was the right call back then. Reporting abuse was the right call in 1998, and in 2001 (the two incidents where Penn State employees witness “something,” and yet apparently only one incident was investigated. People dropped the ball, or covered something up, or protected a man they thought was their friend, but who really was a master deceiver. What we do know about Paterno is that he made a mistake. He should’ve done more. He said so himself, right before he died of broken-man-syndrome. He never implied what he knew, or what he should have done, just that he didn’t do enough. How many times have we all not done enough. How many times do we see broken people all over the place, and don’t have time to hear them vent. How many “crimes” have we witnessed or been aware of via hearsay, and still not reported? 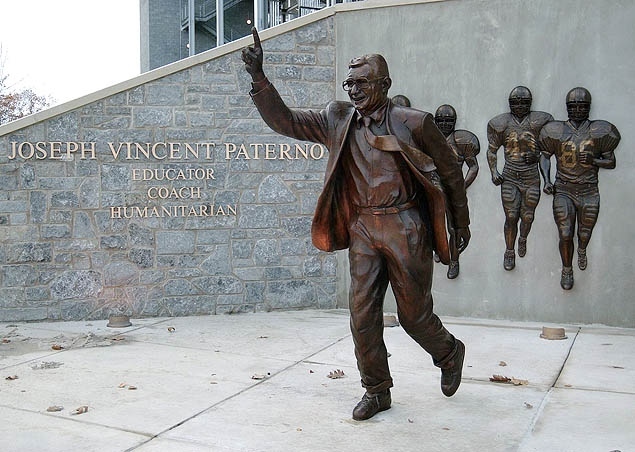 We’re all so morally superior to Mr. Paterno, right? We’d all love to believe we would’ve done more. But given 10 -15% of the information, like many of our close friends will divulge when they have had a transgression, how often do we choose their side of the story. How many times have I said to someone, “He’s a jerk.” Or, “You deserve better,” not knowing the other side of the story. 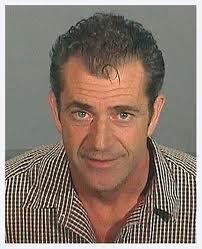 Well, we now know the verdict in the criminal case. We know Sandusky was/is a diabolical creepazoid. A truly manipulative, secretive, disgusting human being. And so there should be outrage. The majority of which should be directed at Jerry, maybe a little towards his wife (who had to know something, right? ), or towards the Second Mile Foundation, which must have had more knowledge of his interactions around young people. There’s a lot of blame to go around, and yet many people seem to have latched onto Joe Paterno’s role in this whole thing like he was a criminal mastermind. Realistically, he merely didn’t do enough, and yes, a lot of young people suffered. A sin of omission, they call it. A sin of enormous omission. And we, the judging mass, who read an article or three about it, are the judge, jury and executioner. And we want blood. If there were still lynching parties, we’d go and find Mr. Paterno, except that he’s already dead. And he never said what he wanted or needed to say. It’s a shame, because everyone should get the chance to defend their name against accusations. Instead, on sports blogging sites, where the average IQ is just slightly above Youtube video commenters’ IQs, the hate and outrage has boiled over to fanaticism. Posts like “I hope he burns in hell,” or “He’s just as evil as Hitler” pepper each comment board related to the tragedy. And the whole thing is just sad. Sad because authorities should’ve intervened at some point, but didn’t. Sad, because an otherwise great old man, is having his body dragged into the same hellish court of public opinion as the real culprit. And sad, that we the reading public, have become so judgmental and generally venomous towards former heroes when their sh!t hits the fan. So, let’s not build any more statues. Because it’s becoming obvious that if you are good enough at ONE thing to get a sculpture built in honor of you, you are wholly lacking in other character areas, and time and changing norms will find you out, and burn your image, instead, in effigy. 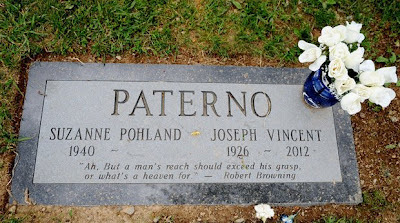 Still, I just can’t seem to damnatio my memoriae of the good Joe Paterno, despite the seemingly conflicting reports. Although, it does make forgiving athletes who used steroids a whole lot easier. 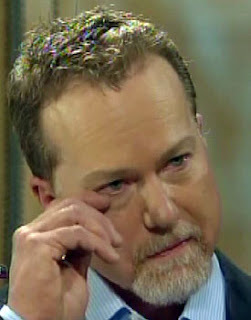 So Mark McGwire, I officially forgive you. Don't cry Big Mac, I forgive you. Did you know he gave over a million dollars a year to abused children? Great archived article on the fallen star. Your right, it is very sad that Mr. Paterno's legacy has been so affected by the evil Sandusky has done. Thanks for your insight. Even though I've been out of the loop with this apparent major scandal, I appreciate that the first I've heard of it was from a human mouth rather than a Gray Whale's mouth--wide open feeding off the plankton of every possible scandalous news. The court documents demonstrated that Paterno was told that Sandusky was molesting boys and chose to not to do anything. In that moment he could have chosen the right thing and saved a lot of future victims, but he chose to ignore it. I don't condone witch hunts, but he decided his legacy in that moment. As a coach and a mentor for countless young men, he could have been remembered for his coaching. The media didn't destroy his legacy. He did. Yes, we all make poor choices, and yes we like to support our friends, but we also all know were the moral line is. He crossed the moral line and his memory will always be tied to the victims. I do wish people would talk less about Joe and more about the 40 men who have to find a way to heal and move on with their lives. Juli Ann, I agree about the healing issue. And the 60+ million dollars that the NCAA is making Penn State pay to abuse victim charities is at least a step in the right direction. I do think, however, that the evidence against Paterno would not hold up in a court of law, and is flimsy at best. Did Joe Pa know something? Yes, I think so. Did he know the extent of the evil, and how often it happened? Almost certainly no. Doesn't release him from his moral obligations, I agree, but it doesn't throw him in the same circle of hell as the perpetrator. The growing cry for blood in our society makes those of us that try to bring meaning where meaning is in short supply like walking into a pride of lions who haven't eaten in 3 weeks while carrying fresh meat. You may be a hero and fresh meat yourself. They have their exits and their entrances, interspersed with sponsor's ads."